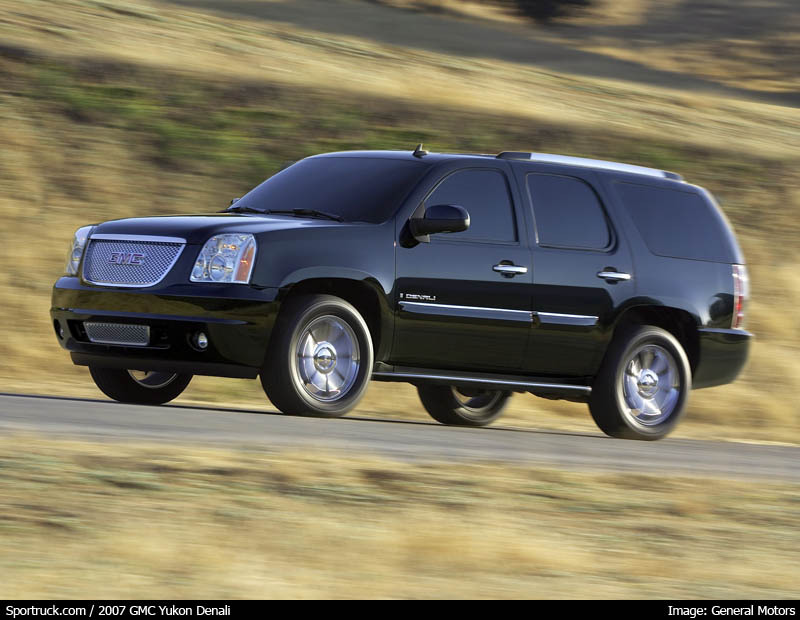 Following close on the heels of the 2007 Chevrolet Tahoe introduction, GMC unveiled the new 2007 Yukon and Yukon Denali today at the California International Auto Show. Both new SUV will be based on the new GM full-size SUV platform. Styling is smoother, and various enhancements have been made to improve comfort and safety. 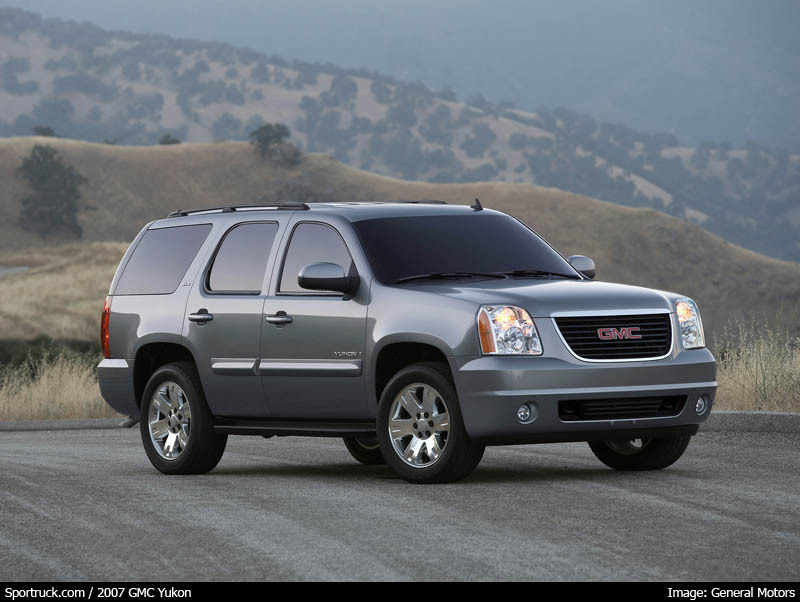 The new Yukon and Yukon Denali will be available early in the first quarter of 2006. Yukon will come in familiar standard SLE (cloth) and upgraded SLT (leather) trim levels, as well as 2WD and 4WD configurations. 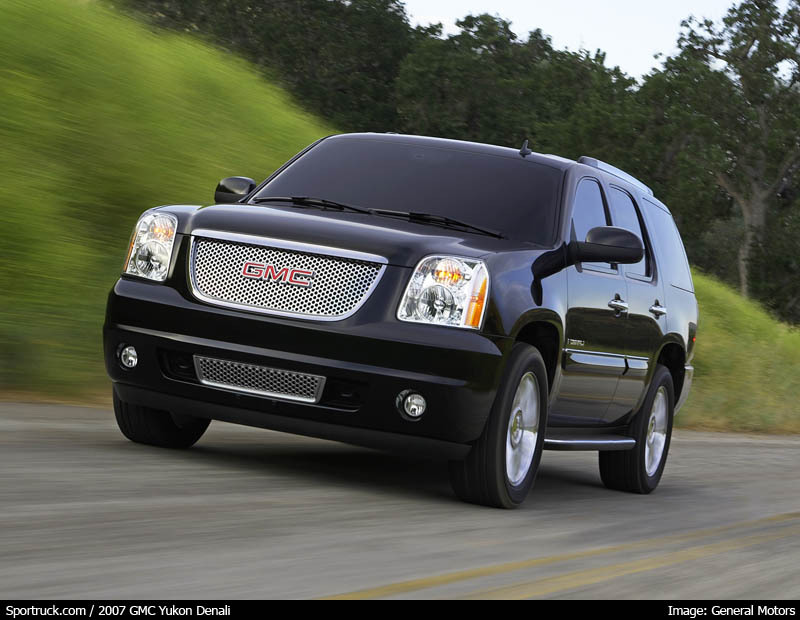 Yukon Denali rounds out the line as the most upscale GMC model, with an exclusive engine and drive train, as well as several unique styling and comfort features. 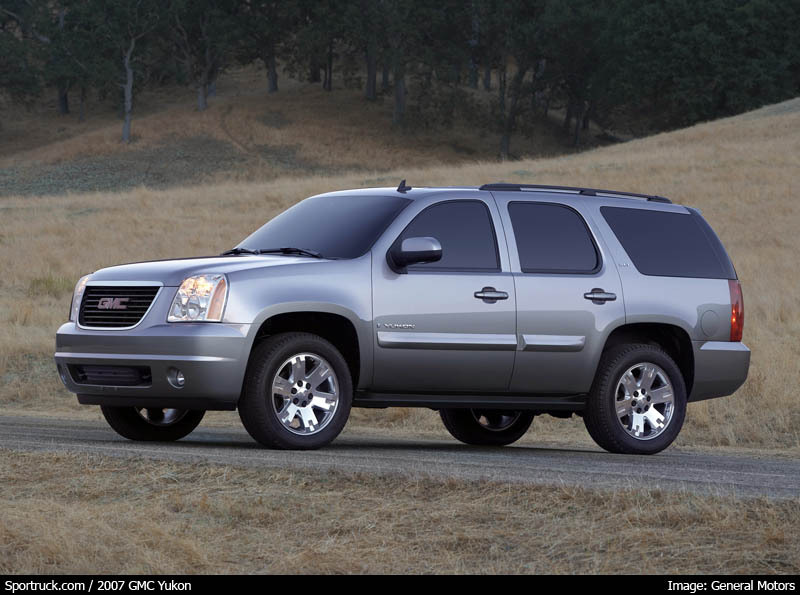 Compared to the 2007 Tahoe, the Yukon has an even smoother and more rounded appearance. Most noticeable of the differences is the front-end treatment. Starting with a familiar GMC-style nose (including a replica of the grill from the current Envoy) the rounded theme continues into the hood, with a smooth bulge that is much more subdued than the Chevy Tahoe. The integrated headlamps are pushed out to the corners, while the daytime running lamps are stacked vertically on top of the headlights. 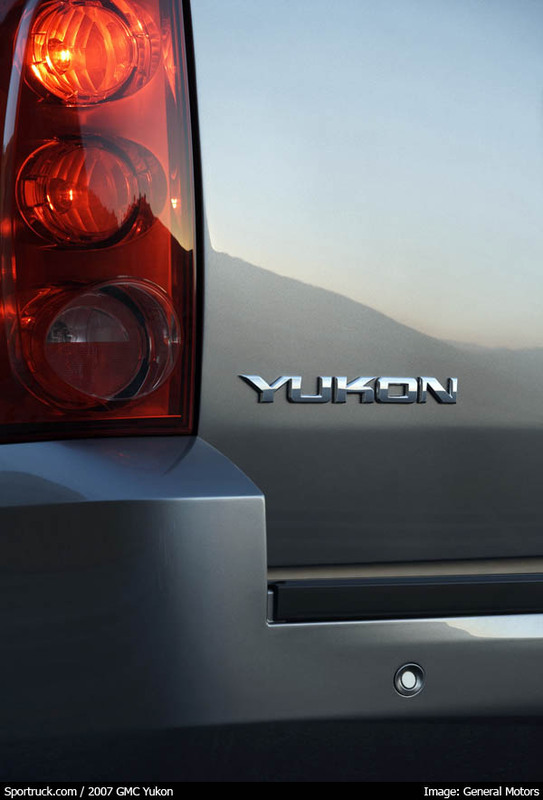 The smooth front look is complemented by a bumper treatment that gives the Yukon a substantial appearance. A horizontal ridge spanning the entire width of the bumper accentuates the size and bulk of the Yukon and plants it firmly on the ground. Aside from teller cut-outs to accommodate the headlamps, the fenders are nearly identical to those found on the new Tahoe, as is the remainder of the sheet metal. 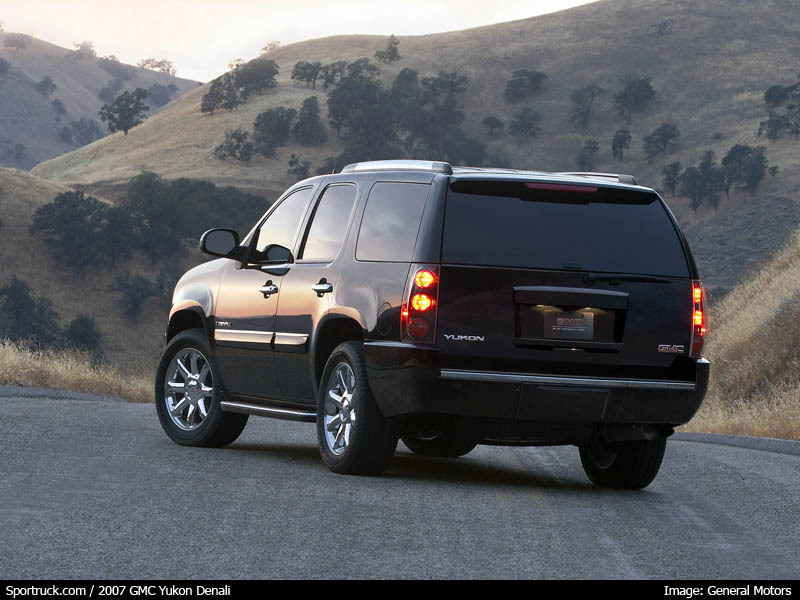 Only the side molding profile separates the Yukon from the Tahoe when viewed from the side. While in back, the tail lamps mark a change -- the Yukon receives an all-red housing -- but the rear has the same uninspired license plate recess placed at the center of the lift gate. 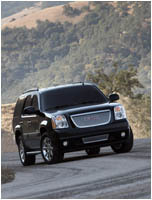 The Denali improves the exterior with bright chrome adornment. 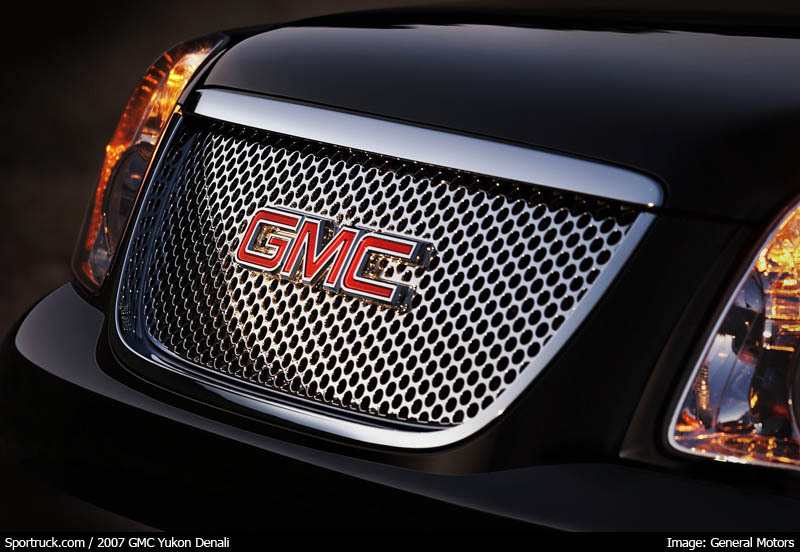 The Denali wears a chrome grill with the signature circular holes, not only in the main grill as expected, but also in the lower fascia. The chrome theme continues via a chrome trim line along the side molding, paralleled by chrome roof rails, and completed with a chrome trim at the top of the rear bumper -- if you can call it a bumper. The door handles are also done in chrome on the Denali. 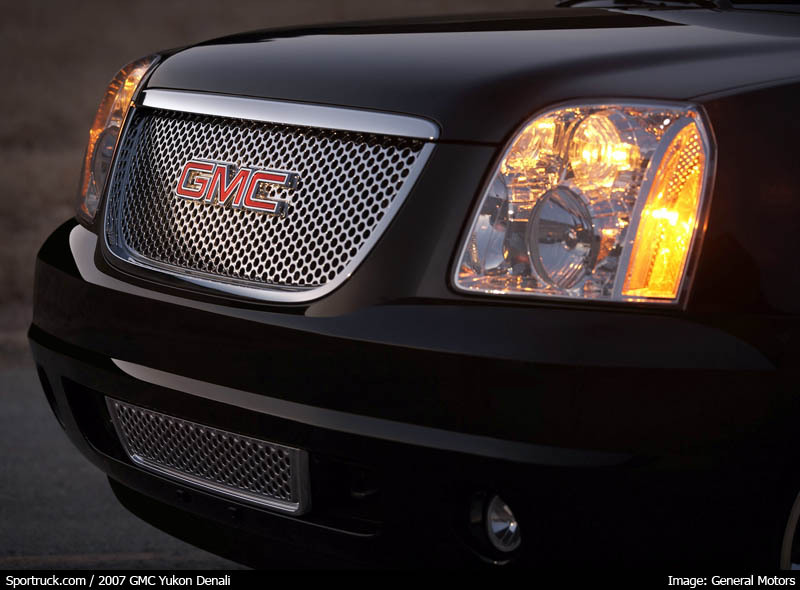 The headlamps differ slightly from the standard Yukon, with a more crystalline appearance due to a smaller amber reflector, and stylish GMC logo etched into the headlamp bezels. 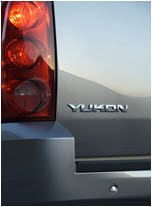 The tail laps on the Denali incorporate a clear lens and dark housing, rather the all-red lens found on standard Yukon. The Denali wears 18-inch wheels from the factory, whereas the standard Yukon uses 17-inch wheels, and offers a 20-inch wheel size upgrade. All models offer integrated running boards, while articulated power running boards are slated to be available by mid-year as an option, along with a power lift gate. Vehicles not equipped with the power lift gate feature an easy-to-operate gate that uses the mass of the tailgate to move to open or close itself once the lift gate is past the halfway position. The new Yukon will feature the next generation small-block V8. This new 5.3L engine, rated at 320 horsepower and 340 lb.-ft. of torque, will be standard equipment at start of production. The 5.3L engine will use Displacement on Demand technology to provide a much needed boost in fuel economy. A Flex-Fuel E85 version, which is capable of running on E85 ethanol fuel or a mixture of E85 and gasoline, is standard on 4WD models and available on 2WD models. E85 is comprised of 85 percent ethanol, which is a renewable resource fuel produced in the United States. A 4.8L V8 engine, rated at 290 horsepower, will become the standard engine of Yukon 2WD models sometime later in the model year. 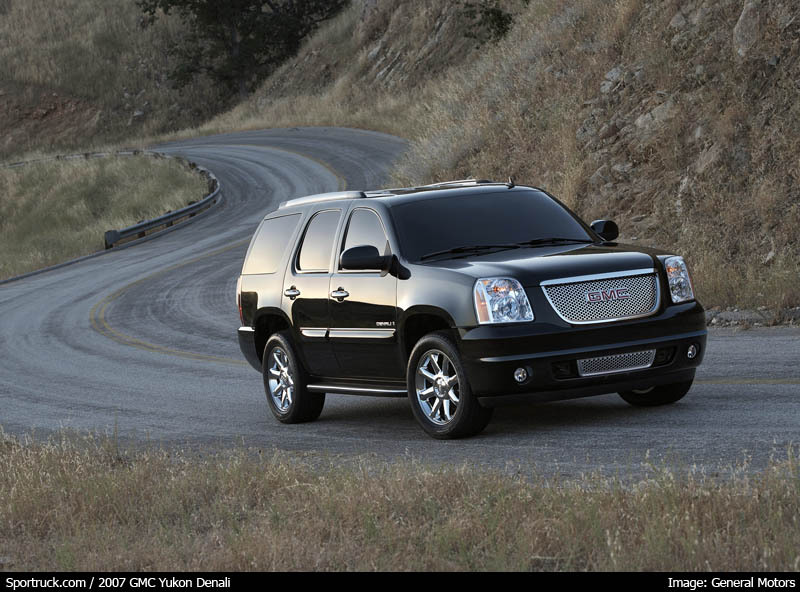 The Yukon Denali will feature an exclusive engine capable of producing 380 horsepower and 415 lb.-ft. of torque. This 6.2L V8 engine uses an aluminum cylinder block and variable valve timing. Power flows into a six-speed automatic transmission with two overdrive gears. The transmission gives the driver manual control via a “tap-up/tap-down” shifting capability controlled by a button on the column shifter. 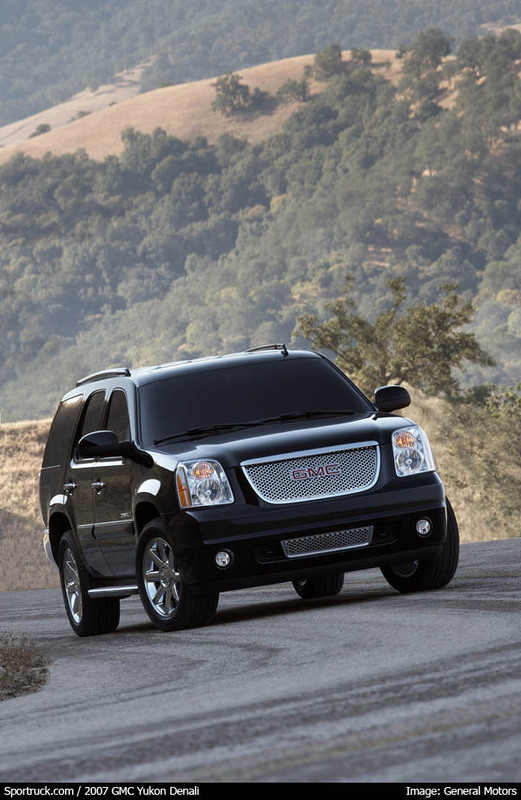 Denali also features all-wheel drive as standard equipment. Inside, there is more space than the previous model. Leg, shoulder and cargo room have all increased, and the overall look is more upscale. 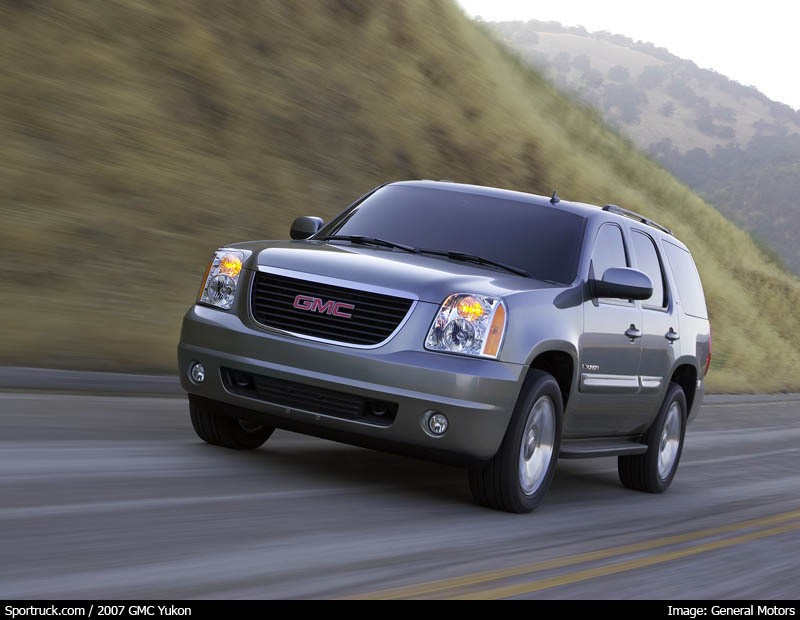 The Yukon now features a two-tone color scheme and an almost car-like dash profile. The overall look is soft and subdued. Instrument panels are condensed and accented by flush-mounted controls lined in chrome. The seats are thinner, offer a wider range of fore-aft adjustment and recline, and are available with heaters for first- and second-row passengers. Everything on the inside appears more refined, with no visible fasteners or unsightly mechanical details. Cargo room has also been increased. The third-row seats now fold flat to maximize the cargo area. As with the exterior, Yukon Denali is distinguished with leather seating surfaces, a unique center console, upscale interior trim and custom sill plates. 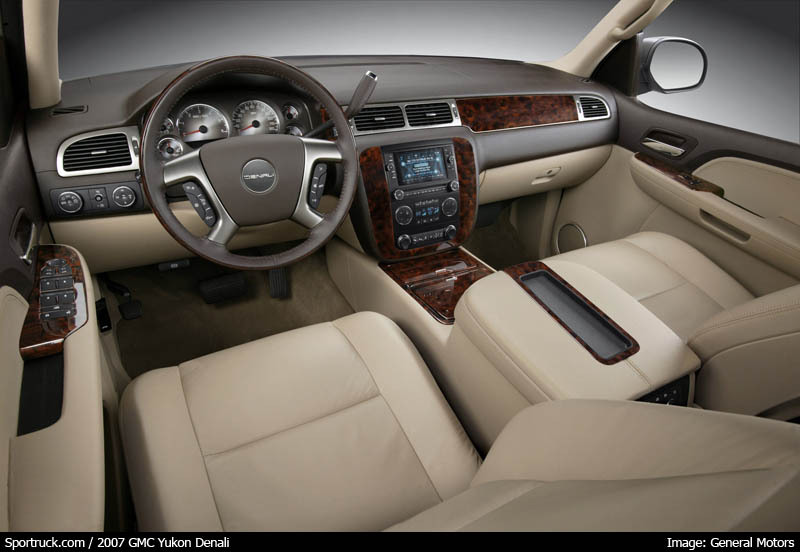 Dark wood trim is used throughout to give the appearance of luxury. The steering wheel features plenty of control buttons, along with leather and real wood, in addition to being heated. Technological enhancements on all Yukon models include three-zone climate control as standard equipment, and automatic climate control on Yukon Denali and Yukon SLT. Available options include touch-screen navigation system and a DVD system with flip-down screen. Key to the success of the new Yukon and Denali will be the improvements in GM’s new full-size SUV platform. This platform features a stiffer, fully boxed frame with coil-over-shock front suspension and five-link rear suspension. The track is wider by approximately 3 inches in front and 1 inch at the rear. 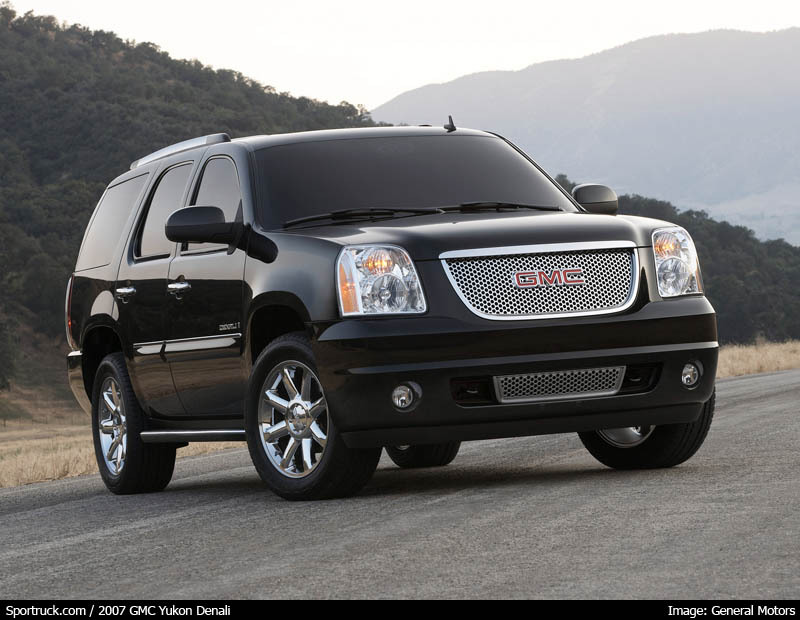 These enhancements, as well as a lower center of gravity, make the new Yukon more stable and secure. The Yukon Denali is further enhanced with a smooth ride thanks to Autoride shocks that adjust damping depending on road conditions. Larger disc brakes are used at all four corners, and by integrating the new ABS braking system and StabiliTrak electronic stability control system, a much safer vehicle has been created. The StabiliTrack system monitors vehicle tip at all times and can selectively apply braking force to reduce the risk of a roll-over. Other safety equipment includes standard airbags for driver and passenger, a tire pressure monitoring system, and the OnStar system. Optional safety equipment includes side curtain airbags, rain-sensing wipers, rear-view camera system, and a rear parking/obstacle warning system. 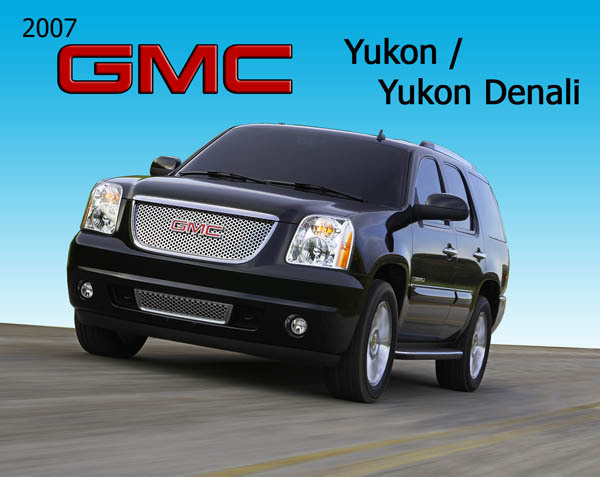 It is obvious GM has designed the successors of Yukon and Yukon Denali with care and competition in mind. 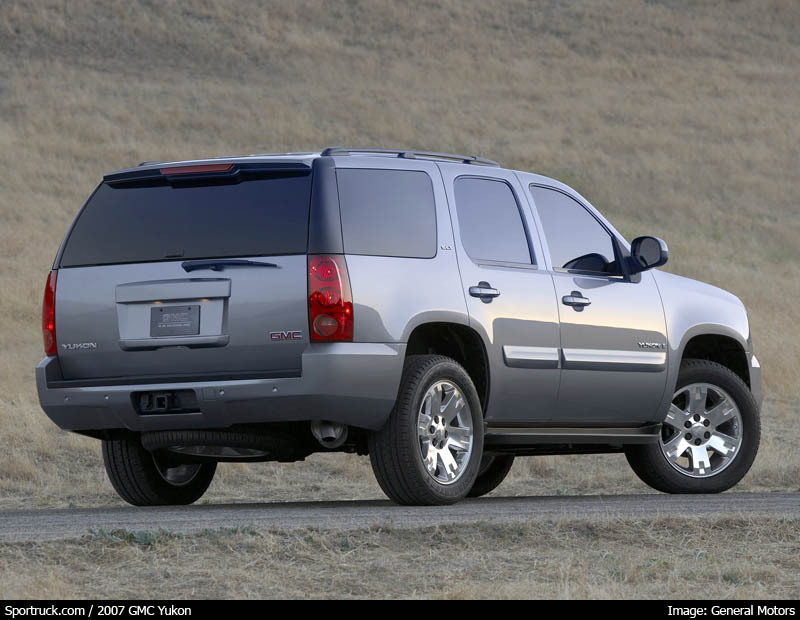 While the Yukon shares the majority of its features with the Chevrolet Tahoe, it is differentiated enough to make it stand apart. For those who demand luxury, the Yukon Denali should continue to be the choice of the discriminating SUV buyer -- at least until they get a look at the final piece of GM’s new full-size SUV puzzle, the yet-to-be revealed 2007 Cadillac Escalade. 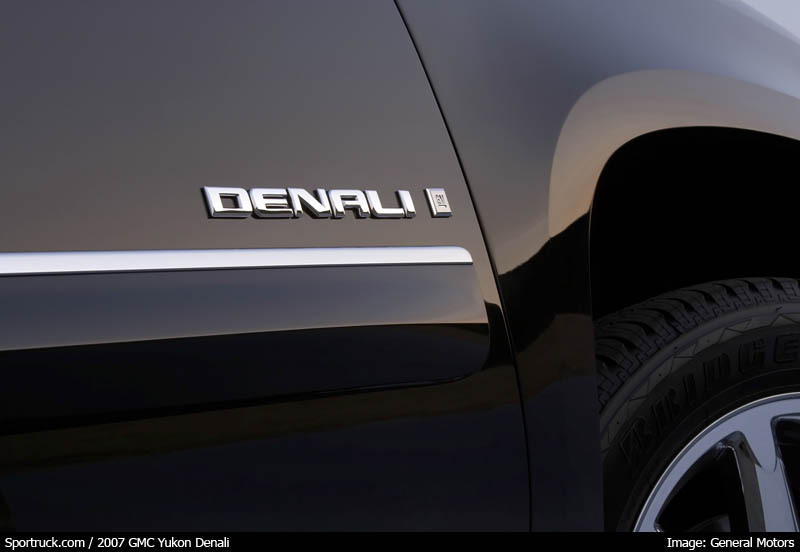 You can expect it to share many of the enhancements of the Denali, along with a bit more chrome.